How are Personal Capacity Limits Calculated? This feature-rich tool provides the possibility to plan people allocations on projects, taking into account their current and planned allocations to foresee potential conflicts. It allows the user to specify the resources - teams and individuals - that are required for a project, how long they will be needed, and what % of their total working hours they can be available. This allows project and program managers and team leads to visualize and quickly manage possible over- or under-allocation. Below, we cover the scenario for planning plan people allocations on projects, not accounting for how much work people currently have or will have to complete in every project. With every new project, you must plan activities, and assume how many and which people - teams and individuals - you need for a project. This information empowers you to plan people allocations, specify how long you need each person and team and what % of their total work time they should be available for your project. On a timeline View where project is selected as lanes and user allocations and team allocations are selected as cards, we create the required allocations using a quick add option. When an allocation is created within the software for a person who is not assigned to the project, that person will be automatically assigned to the project with their default role. When creating a team or user allocation, the available time slots for this team or person are shown in the Possible Date Ranges drop-down list. Simply select the required period and it will reflect in the start/end allocation dates fields. When explicit dates are not specified (as 10/10/2015 - 10/10/2016 for example), allocations dates will link to project dates. If project dates are updated, then allocation dates will update appropriately. There can't be more than one simultaneous allocation for a user or a team created on the same project. For example, on the image below you can see that two teams - Alaska and Utah - are required for 100% of the project duration. We need a project manager for only 50%, and a designer for 80% at the beginning and only for 25% after that for the Chocolate Factory project. Once we start planning people allocations on a project, we easily see if the newly created allocation is in conflict with existing allocations for this person or team. In this example, you can clearly see that, if the projects proceed as planned, the Alaska and Utah teams will be overloaded for a period of time. See the details of the overload by hovering your mouse on the overloaded area. We have a choice to either look for other people/teams to work on our project or shift the project's time periods to avoid conflicts. Update allocations from this View via the context menu. Right click to open a context menu and click Edit to update an allocation. Here you can modify allocation dates and % of allocation. To see all the allocations of a team or a person, simply double click a card and a list of allocations will display on the Allocations tab of a team or a user View. Right click an allocation in the list to update it via a context menu. between project planned start date and project planned end date, when a project is not started yet. between project start date and project anticipated end date, when a project is started. As soon a project is complete, all the in progress or planned allocations for this project (there are parts which are after the project end date) are not taken into account anymore when people load needs to be calculated. As soon as a project starts, allocations start and end dates are no longer automatically updated. When a new allocation is created on a project, its dates can be explicitly specified (as 10/10/2015 - 10/10/2016) or linked to project dates. If allocation dates are specified explicitly and project dates are updated, then all the people allocations inside scale according to a project duration update. For example, if a project initially was planned for 3 months and the Utah team was planned for 1 month for this project. Later if a project duration is updated to 6 months (doubled), then the Utah team allocation duration will change to 2 months (doubled). This allows you to keep the planned people allocations dates and duration corresponding to project dates, when project planned dates are updated. When a project is started and its start date is different from a project planned start date, then all related people allocations must be updated accordingly to fit the real project start date. In this situation, all project allocations are shifted to a 'project start date - project planned start date' delta. A new Anticipated End Date is calculated. An anticipated end date shows when a project is planned to be completed considering the real project start date. It's calculated as 'project start date + project planned duration (i.e. project planned end date - project planned start date)'. As soon as a project starts, a project start date and anticipated end date shows on a timeline, where projects are selected as lanes. All the allocations linked to a project planned end date start being linked to a project anticipated end date. It will also show on a timeline. All the allocations, which are linked to a project anticipated end date, start being linked to the latest of a project forecasted end date and a project anticipated end date, so that we can see if people can become overloaded due to a project delay. The information about people overloads is also visible in the software, on a timeline View, where projects are selected as cards. Whenever you plan a project in time or if a project is delayed and it leads to people being overloaded, you’ll see the conflicting areas highlighted. You’ll often need to answer the question, "Whom can I invite to work on my next project?" or "Who may become available at a given moment of time?". Answer this question by creating a visualization where our people - teams or individuals - are selected as lanes and people allocations are selected as cards in those lanes. The smallest zoom level shows the % people who are busy or available for any period of time. Here the tool shows if someone is accidentally overloaded or might be overloaded soon, and gives an understanding of who will be available soon to work on a new project. On the example above, notice that the Alaska Team’s allocations at the beginning of 2017 show overload at 130% total. While the Utah Team is 100% available starting in May 2017. We can allocate them to a new project. Tracking vacation and day-off time is not currently supported in People Allocations software so far. Instead, split personal allocations into parts and create gaps with zero allocation percentage for vacation periods. Team Project Allocation add, edit, delete 'Edit' Project permission in Project Role. No Team membership is required. It is possible to install a bunch of helpful views from Solution Gallery. 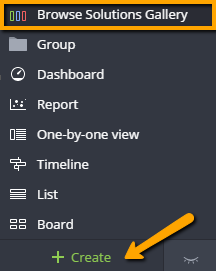 Click + Create > Browse Solutions Gallery in the left menu. 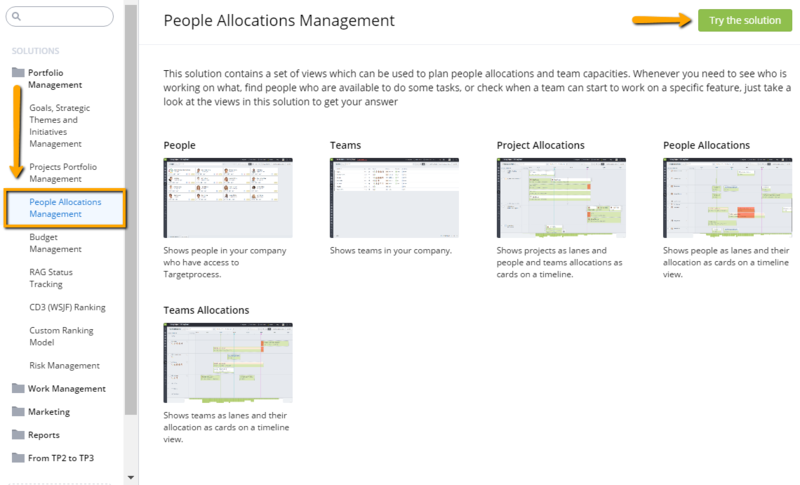 Then in the Portfolio Management folder, open People Allocation Management solution. Views can be installed from the solution. When allocating human resources, your project and program managers need to have total visibility. And if you’re planning on doing resource allocation manually, chances are good that you won’t get far. That’s why at Targetprocess, we developed an enterprise-level human resource allocation software, that lets you see the team’s availability and build reliable estimates for working hours required on a given project. With its built-in human resource allocation features, Targetprocess allows you to streamline your workflows without “what-if” scenarios, overloading and overplanning.